The Failure & Success PowerPoint Template displays the road signs to explain right or wrong directions. The signboards are often used in business presentations to demonstrate immediate decisions and response from audience. 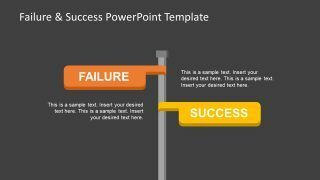 This failure and success PowerPoint template contains 2 slides of similar design but distinct backgrounds. 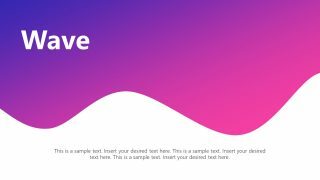 These slides help the user to pick a black or white background template according to their presentation theme. Further, there are only two sign boards which appear on the pole. 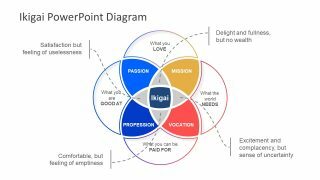 But the customization features of PowerPoint let the users copy and insert more labels. For example, add problems and defeat below failures by copying the road sign. Next, change the text and shape color. 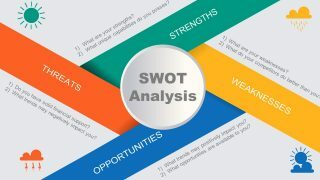 In many presentations, the slide of failure and success can assist in analyzing the various aspects of idea or concept. 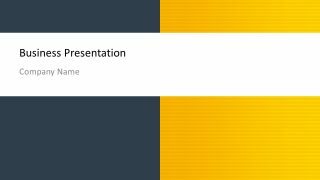 The Failure & Success PowerPoint Template is suitable for motivational speech presentation. The use of failure and success signboards can go well with the inspirational quotes. However, the two-way road sign enables presenter to highlight consequences of a decision. Because an idea can either be profitable or it could go in loss. The audience can assess the hypothetical idea, listing the pros and cons to avoid actual damage to the business. The slide of failure and success road sign can boost the engagement on presentation. Because it invites the suggestions and ideas from viewers to make decisions. 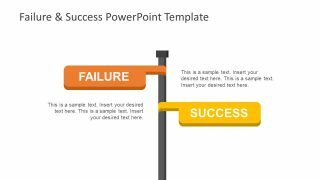 The PowerPoint template of failure and success uses eye-catching colors for signboard. Instead of using the green and white signboard, which has been used for many years. The modern design contains vector PowerPoint shapes. And, users can quickly change colors, styles, and effects of these shapes. Further, there are text placeholders for both success and failure segments. These can display pro and cons of a project or idea.